The residence of the first governor of St. Petersburg – Alexander Menshikov is located on Vassilievskiy island, which the Emperor Peter I , once, had presented to him. Construction of the palace had started in 1710. There were two houses, building simultaneously – wooden and stone. Wooden house was completed in just one season, and was named “Ambassador’s home”. This house was used for grand receptions and assemblies. The Stone House, which had later become the Menshikov palace, was built by the project of the architect D. Fontan. The first floor had been ready a year later, and the mansion owner had held a magnificent celebration for his new home. The constructions were completed only 4 years after, and Governor Menshikov had opened the doors of his home for the countless guests. Until 1727, the main building was constantly joined up with something new: the east wing, the west wing, the area around the palace. Nowadays, the Menshikov Palace is a museum. 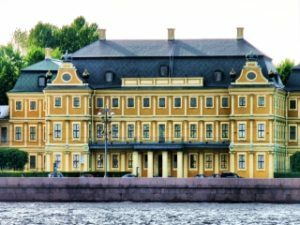 In 1967, the building was allocated under State Hermitage Supervision, and the Palace was returned to it’s original appearance. The exhibition is devoted to the Russian aristocratic household of th second half of XVIII century. You will see the partially restored residential interiors. There are personal belongings of Peter I and Alexander Menshikov among the exhibits.